Penguin Publishers has this awesome feature on their website called "Penguin Storytime" where they spotlight different children's books. 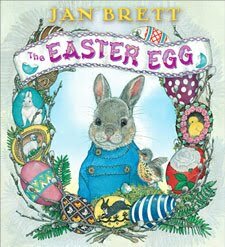 One of their recent entries features an interview with Jan Brett and she discusses her newest children's book, The Easter Egg. She shows off some Cochin chickens and a rabbit named Tiki that she used as a model for a character in the book. My daughter also enjoyed watching Brett detail the steps involved in drawing a bunny. A bunny named Hoppi wants to make an amazing egg for the Easter Rabbit to hide on Easter. He visits all the other bunnies in the forest and worries that his skills are not up to par. Then he stumbles upon a special egg and ends up using his skills in a way that truly impresses the Easter Rabbit. If you hadn't noticed, The Easter Egg is currently number one on The New York Times Children's Books Bestseller list. The kids and I had the opportunity to read the picture book at a nearby library. I must say this is an almost perfect Easter Bunny themed Easter book! Done in a similar style to her previous books, Jan Brett's illustrations are amazingly detailed and gorgeous. Hoppi is such an adorable, caring little bunny and resembles the blue coat wearing Peter Rabbit. We fell in love with the Easter Rabbit's cart and his team of beautiful feather-footed chickens. An intricate pussywillow border grows and changes with each page turn. The kids are sure hoping that the Easter bunny will place a copy of The Easter Egg in their Easter basket this weekend! Be sure to visit Jan Brett's website. It includes a lot of information about her books, plenty of coloring pages and activities and also contests. Currently there's an Easter Egg Sweepstakes to enter and the winner will receive a hand-painted egg made by Jan Brett. Ends 4/8/2010. In addition, fellow children's book blogger Amy at Hope is the Word wrote last week about her experiences at a stop along Jan Brett’s Spring Tour. She posted plenty of pictures of her family at the signing. I am an Amazon affiliate and may receive a very small commission for products purchased through my Amazon links. Rosie and I are going to a storytime/Easter party tomorrow and the Easter Egg is the book! Thanks for the heads up - I'm looking forward to it. I absolutely love Jan Brett books! I didn't even know she had an Easter one - I'm so buying it. :-) Eventually. A Princess Tea Birthday Party! Finally - the winners list. Oh Say Can You Say? It's Dr. Seuss Day!